We have an in-depth buyer's guide for the best dog foods for small breeds below. However, if you want to see our top picks at a glance, you can do that here, too! We've selected three products that really stand out from their competitors, based on factors like quality and price. Topping our list is Hill'S Science Diet Small & Toy Breed Dry Dog Food, for adult dogs under 25 pounds and one to six years in age. It comes in chicken or lamb flavors, so pet parents have a few flavor options for feeding their fur babies. What's nice about this particular food is that it is fortified with extra vitamins for added health benefits. It's also easy to eat for smaller pooches, as this variety comes in small, bite-sized kibble. The ingredients label also reveals that the first ingredient is meat-based chicken (chicken meal). The 4.5-lb pound bag for adults costs $13.99 on Amazon, so it's affordable too. As such, we give this product a perfect 10 rating! Pet parents on the hunt for a bargain can find that in the Purina Pro Plan Small & Toy Breed Formula Adult Dry Dog Food. 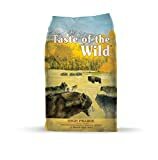 The 6-lb "chicken with shreds" flavor bag for small breeds costs only $11.68 on Amazon! This food has real chicken as its first ingredient, so pooches will get plenty of high-quality protein when they chow down. Other vitamins, minerals, and fatty acids are included specifically to boost skin and coat health. The food itself is made of various shapes—"shreds" and typical kibble bits—so it will be easy to eat, as well. Owners with picky eaters can also rejoice at the fact that Purina offers four flavor varieties. With all that it has to offer, we give this item a 9.5 rating! 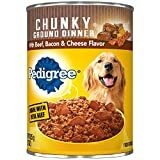 The chicken-flavored 15-lb bag of Pedigree Small Breed Adult Dry Dog Food is the best priced item on our list, costing $12.44 on Amazon! That is roughly 78 cents a pound. This item is made in the United States, and comes in both chicken and steak varieties. This product also includes omega-6 fatty acid to support a shinier coat. The kibble come in various colors and shapes, so it can make dinnertime more interesting for your pooch. As far as ingredients go, the company claims this product does not include certain items like high fructose corn syrup. However, dog owners should note that of the first five ingredients listed, only one is meat based (poultry by-product meal). Overall, we give this product a solid 9.3 rating. Looking for more information on how to feed your small doggo or pupper? We can help with that! Please read our in-depth buying guide below, so we can help you make an informed purchasing decision when selecting the best food for your small breed dog. Anyone who has ever owned a dog knows one thing for sure: every pooch is unique with her own personality and quirks. What you might not realize is that the breed and size of your dog plays an important role when trying to determine what kind of food you should be feeding her. All dog breeds and sizes can have different nutritional requirements. Our focus here will be on those lovable small breed dogs. The best dog food will properly nourish your pet with the energy she needs to zoom through her day-to-day activities. First things first: you need to factor in the breed and expected size of your pooch before you can sniff out some food. If you have a puppy, you'll need to consult a veterinarian to find out what size your pup will probably grow into. All puppies may seem small, so it is important to know what the typical size range is for the breed of dog that your pup is. Small dogs are those that are typically under 22 pounds and with a height that is under 16-18 inches. Some examples of dogs that fall into this category are breeds such as the Chihuahua, Pug, Dachshund, and Yorkshire Terrier. Once you have determined that your dog falls into the small dog range, you have to take into consideration their age. Puppies have different nutritional needs than adult dogs, and senior animals will also require specialized diets. Small breed puppies typically grow at a faster rate and have higher metabolic rates than large breed puppies. This means that they burn a lot of calories quickly. Food for a small breed puppy should be higher in protein and calories. Because they burn through calories so fast, it is important to feed them roughly three to four times a day to keep them in optimal health. Of course, always consult a vet to confirm that your pup's eating habits ensure she gets proper nutrition. If pups don't receive a sufficient amount of calories on a regular basis, they can show signs of hypoglycemia or low blood sugar, just like people. This can manifest in ways, such as lethargy, weakness, seizures, and muscle tremors. These conditions over time can sometimes even become fatal if they aren't addressed properly. To avoid these scenerios, it is important that you keep a regular schedule of feeding. Many pet owners find a routine that works best with their own schedule, and tailor the timing to fit with their lifestyles. You can also consider keeping food available to your dog at all times. Some dogs will gulp every morsel down in seconds, but many dogs adapt to this way of feeding while also developing good eating habits. Over time, they will acclimate to this process, and it can prevent them from eating every bit of food the second it's placed in front of them. You and your vet are the best sources when it comes to deciding what feeding situation works best for you and your dog. The important thing to keep in mind is that small dogs need different amounts of calories and nutrients than larger ones. Smaller dogs typically have longer lifespans. Nourishing them with properly balanced diets right from the start can help give them the best shot at living longer, healthier lives. It is important to choose a high-quality diet. Many commercially available foods are clearly labeled for small and toy breeds. Most will specifically state the size of the dog they are meant to feed. When you buy a size-specific food, these products should have been specially formulated to contain the optimal blend of proteins and other requirements for dogs of that size. No matter the age or breed of your small dog, you still need to be wary of overfeeding. Small dogs, just like any other animal or person, can quickly become overweight if they are fed too much. You can keep this in check by watching the amount they consume, weighing them on a regular basis, and limiting the amount of extra treats they get. Obesity in dogs can cause them to develop health issues that can create problems in any and all life stages. There are many commercial foods available that cater specifically to small dog breeds. Keep in mind that there are major differences between puppy food and adult food. If your dog is a puppy, make sure that you are feeding them food specifically prepared for puppies. These foods are full of vitamins and minerals that are critical to a growing puppy's needs. As mentioned previously, small breed dogs grow at a much faster rate than their larger counterparts, with many breeds nearly reaching their full adult size by the time they are approaching their first birthday. Whereas larger breeds typically don't reach their full size for a couple of years. What Size or Breed is the Food Marketed Toward? Dry dog food comes in different sizes. Because of their smaller mouths, pooches might have an easier time consuming smaller kibble. When looking at different available foods, the labeling can give you some indication of the food's size. Food for smaller breeds is often labeled directly as such. However, unless specifically labeled as food for large breed dogs, most dry food comes in a medium-size kibble. Unless a food is directly labeled as small or large breed food, it can generally be assumed that the food is of a medium size. This labelling makes the different brands appealing to people who have dogs of all sizes. One of the most important steps in sniffing out the best dog food is to check the label on the bag. This label is always a good place to start, whether you are buying food or treats. This process may seem daunting for people that are new to buying dog food. But, with a little bit of patience and research, you will find that this process doesn't have to be worrisome at all! What Does the "Complete and Balanced" Label Mean? "'Complete' means the product contains all the nutrients required." "'Balanced' means the nutrients are present in the correct ratios." This labelling can take some of the guesswork out of whether or not your dog’s food contains the ingredients that Fido needs. These labelled products generally contain ingredients that are formulated to meet your dog’s nutritional requirements. It should contain at least the minimum nutrients considered necessary, and in proper proportion to your pet's size and age. Usually, a label can only earn a "complete and balanced" rating if it includes feeding instructions based on these variables. How Should I Read the Ingredients Label? Look at the list of ingredients. This step is an excellent way to see what the primary components in your pup's meals are. Ingredients are generally listed in order of predominance, meaning that items used more by weight are listed first on the label; ingredients used less by weight are listed lower. This ordered labelling is where you will clearly be able to see that all foods are not created equal. You will find that the list of the ingredients will vary tremendously depending on the quality of the food. For example, foods that are good for dogs should contain high-quality protein in the form of meat-based ingredients, such as chicken. If you have to go far down the list to find a meat-based source of protein, it's probably a sign that this particular product isn't too great. What Ingredients and Nutritional Supplements Should I Look For? Make sure that whatever food you choose has the necessary protein and nutrients that your dog requires. Many foods contain the necessary vitamins and minerals, but some are crafted better than others. Keep in mind any allergies that your dog is known to have. This can have a large effect on the brands and types of food available from which to choose. It is important to purchase food with sufficient protein. Proteins are necessary for proper growth and maintaining complex body systems. Proteins are made up of essential and non-essential amino acids. Some of these amino acids are naturally produced within the body. These are known as non-essential. Essential amino acids are ones that are not produced by the body, and must be consumed from outside sources. This is where good, quality food comes into play. Dogs need protein and fat, so it's also important to be on the lookout for fatty acids. These acids are necessary for providing your dog with energy. They also can improve taste and aid in digestion. An example of this type of acid is linoleic acid, which is something commonly listed on a food bag. This acid can be found in corn, whole grains, and body fats. Omega-3 and omega-6 fatty acids are also commonly listed on a bag. Sources for these acids include fish oil, flax seed, egg yolks, lean meats, and poultry fat. Omega-6 fatty acid is commonly included to promote healthy skin and coat. When reading the label, you might also come across mouthfuls like "animal fat preserved with mixed-tocopherols." Oftentimes, dog food contains animal fat for a flavor boost. Okay, but what about the other part of that mouthful? Tocopherols are simply chemical compounds that help make up vitamin E, which manufacturers often add to boost the immune system. Good dog food will also include whole fruits and vegetables to help provide your dog the nutrition she needs. Sweet potatoes, peas, and carrots are included in many meals for their taste, nutritional worth, and value as whole vegetable thickeners. Apples are common fruits to find in specialized treats. It's okay to find some grains in your pet's food, so long as there is still meat-based protein listed high on the bag. Dog owners should check for healthy whole grains. Brewers rice is commonly found in commercially available dog foods. This rice is heavily processed, which means it lacks many nutrients found in whole grains. Why do manufacturers include it then, if it is not nutrient dense? Simply put, it's a cheap filler. Finding this ingredient does not mean your pet's food is automatically awful, but it does mean that other ingredients need to be especially nutrient dense to compensate. It's also possible to feed a small breed a grain-free diet full of healthy fiber. Grain-free recipe options are quite popular, as they eliminate nutrient-lacking grain fillers present in a lot of commercially available products. Although it's a little tricky to find, it is possible to find grain-free small breed dog food. It can't be stressed enough that you should try to buy the best quality food that you can afford. You can go online and search reviews, as well as talk with your veterinarian about the ingredients and get recommendations. There are many resources that you can use if you find that you need detailed information about a specific brand of food. Food for small dogs needs to have the correct ratio of vitamins, minerals, and other nutrients to ensure they are getting enough nourishment to fuel their many adventures. Some dogs have allergies to different foods, and it will take some trial and error to find a diet that works well with them. Fortunately, there are many products available that are free of common allergens, and may be suitable for canines with allergies. Many veterinarians also have prescription diets that are available in their offices. These are specifically formulated foods that cater to specific allergies or dietary requirements. Your veterinarian can be your best friend if you are dealing with specific health concerns. Note, however, that just because a product says it is hypoallergenic does not mean it won't trigger an allergic response. Dogs can have allergic reactions to many different things! Hypoallergenic foods are usually just free of common allergens; however, your pooch may still be allergic to some of the ingredients, so always double check the label first! Limited ingredient diets are one alternative food for small breeds, especially for animals with allergies. Fewer ingredients means less chances that there is something in the meal that will upset a sensitive canine, after all. As your dog ages, her food requirements can also change. A trip to a pet shop will show you that there is food available specifically formulated for the needs of older dogs. Many of these diets contain different levels of protein, sodium, carbohydrates, and other ingredients. They may also contain ingredients that help address issues that older dogs can develop, such as arthritis and inflammation. Turmeric and curcumin supplements are quickly becoming popular to aid pooches with hip and joint pain! Specialized senior dog food can also contain prebiotics that can help older dogs with digestion. If you find yourself struggling with different choices, again, your veterinarian can be quite helpful with recommendations. Some people are really attached to their dog food brands, and that's okay! There's lots of reputable brands out there worth buying again and again. However, be careful not to let brand loyalty make you unwilling to try food for small dogs that could be potentially better than a formula you currently use, especially if said formula is not helping your canine maintain proper energy levels, healthy digestion, or decent skin and coat health. Fortunately, if you are interested in checking out new food for small dogs or simply different food brands, a review is easy to find online. Usually, reviews are on the company or seller's own site, or through an online retailer like Amazon. Little pooches often have big personalities. Small breed dogs eat what they want! Unfortunately, many of our beloved pets are quite picky when it comes to their meals. As such, texture may be a make-it-or-break-it factor when it comes to picking out pet food. There’s a variety of textures out there, so most people can find something that their fur babies will enjoy. When it boils down to it, the best dog foods are ones that pups will actually eat. Common options include dry and wet dog food, although freeze dried is also becoming a popular option. This type of product is dried through a process of low-temperature dehydration. Essentially, products are frozen, and after a few steps, water (persevered as ice) is removed. Pet parents who opt for dry varieties should consider the size of the kibble. The best dog food for small breeds should be, well, small. After all, smaller canines have smaller mouths and smaller teeth, so they can have a ruff time trying to chow down on larger bits in their food bowls. If you want to bring some new products into the home, you'll need to factor in an adjustment period. In other words, you want to slowly switch Fido over to a new diet. Over a period of one to one-and-a-half weeks, slowly add the new food in with the old until only the new remains. You can check how well your canine is doing on new products by checking his energy levels, bowel movements, and changes in skin and coat. Feeding small dogs doesn't have to be complicated if you go into it with an informed mind. Just being aware that your dog’s size can make a difference in your choice of food is a great first step! Hopefully this information has given you some things to consider as you go about picking out the perfect food for your furry friend. While it may seem overwhelming at first, you will find that a little knowledge and patience will help you navigate the dog food world. There are many resources and reviews about many foods currently on the market. There are also online communities of pet people that can be very helpful in answering your questions. As stated earlier, your veterinarian is also an invaluable source of information and can tell you specific food requirements for your individual dog. There isn't any specific brand that fits all situations, but with a little time and research, you can feel confident that you are providing your dog with the best nutrition you can. You can soon find yourself able to navigate through all the different choices on the market. Knowledge is power, and you can rest easy knowing that you are giving your dog the best chance at a healthy and happy life. Disclaimer: This article is not intended to replace the advice of a licensed veterinarian. Any comments, questions, or concerns about food brands, specific dog food, or the wellness of your pet should be directed toward a vet.